Marketing to your established client base is important to keep them coming back for more. Inviting them to trade shows is one way to remind them of your business. If they do come to the trade show, this further solidifies in their mind that you’re still active in your business and eager to meet their needs. Always invite your current clients to trade shows and streamline this process through automated print. 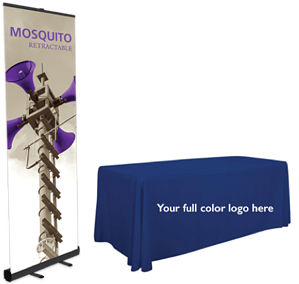 With so many vendors at trade shows, standing out is difficult. Customers will likely not remember you after they walk away. This is why following up is so crucial. If you did gather some leads, you’re the one who must maintain these sale possibilities by reaching out again. Automated print streamlines this process, ensuring that you follow up every single time. Marketing possibilities thrive when potential clients visit your website. What if for every website visitor who clicked a certain URL, you automated a direct mail response to them? How certain are you to reach your target market in a specific way based on the type of page they visit? Automated print enables you to reach that goal. When a web visitor downloads content from your site, you’ve found a potential client, but how do you reach them in a personal way that keeps them coming back for more? For every visitor who downloads content, automate the delivery of another complementary download from your site. Give them more than they expect and do this through automated print. For those clients and prospects who already have accounts with you, finding an effective way to continually reach them takes strategy. Use a custom field in your CRM to deliver printed collateral to customers and prospects. Ensure you’re not just targeting new clients, but already established ones. Another way to reach current clients is to give them a reason to move forward with a decision they’re close to making. Delivering high-value collateral, such as an ad specialty, when you know they’re considering a purchase gives them the extra incentive they need to make the purchase. Use print automation to give them the extra reason to move forward. It’s common for customers to leave valuable purchases incomplete in their shopping carts when they are uncertain about a purchase. Often, all they need is a little extra push to sway their decision. Sending a printed coupon for the item in their cart could be the difference between them making the purchase or ignoring it. Using automated print streamlines the delivery of coupons, ensuring you never miss out on a sale. People generally ignore sales emails because they’re tired of businesses targeting them and cluttering their inbox. Businesses know this, but many do not change the way they’re reaching their potential clients. If people won’t open their emails, what will they open? Automated print provides an answer by allowing you to send mail via FedEx, which people are more likely to open. When a customer does fill out a survey card about a recent purchase, following up is vital to demonstrate you care about their comments. Automated print assists in ensuring follow-ups happen every time. Let your customers know you value them and their experiences with your business by using printed follow-up materials. The benefits of using automated print are vast, and it doesn’t take long to see they provide many opportunities to uniquely reach specific targets in seamless ways that involve little forethought. Set up automated print to consistently reach the clients you already have and the consumers you want to secure as loyal customers.